Sorry about the lack of postage!! My Halloween was a teenagers Halloween. I was not allowed to trick-or-treat this year because of the age factor. How it would be to be a kid again. I did dress up despite the fact that I was not permitted to go trick-or-treating. 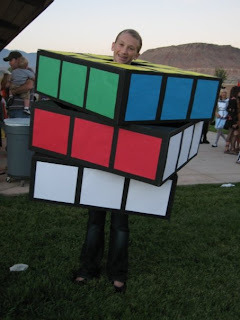 I was a rubiks cube. Your probably thinking oh...how cute, right? Well it wouldn't be so cute if you had to wear it to school> I couldn't even fit through the door. Between classes and at lunch I wore the costume, but during classes I did not. Try getting this thing on the bus! Courtney I love the costume! That is so creative. It does look like it could have been hard to move around in. We miss you!